Court Refuses To Extend Patterson And Juarez Protections To Quasi-Franchise Confronted With Employment Misclassification Claims. For decades, it has been commonplace for non-franchise businesses using a quasi-franchise business model (i.e., any business format license) to distinguish themselves from franchisors in order to avoid the arduous California franchise laws. A recent California district court case suggests that this may be changing – at least when confronted with employee misclassification claims. 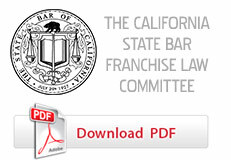 In Ambrose v. Avis Rent a Car Sys., the defendants – owners of an independent operator business model – argued that their business model was “functionally indistinguishable” from a franchise in an attempt to secure the same protections the California Supreme Court recently extended to franchisors in Patterson v. Domino’s Pizza, LLC. As detailed below, while the district court ultimately refused to extend Patterson (and other franchise cases) to the quasi-franchise business model at issue, Ambrose presents a rare instance in which the putative franchisor argues that its business model is indistinguishable from a franchise, while the licensee vehemently opposes the franchisee designation. At the very least, this shift in arguments suggests that the laws facing franchisors doing business in California are becoming less tendentious. In 2006, Tammy Dotson (“Dotson”) entered into an Independent Operator Agreement (the “Operator Agreement”) with Budget Rent A Car System, Inc. (“Budget”) for the operation of a Budget Rent A Car business in Riverside, California. Otherwise “honor Budget standards” and follow Budget’s Agency Operator Guidelines. Further, the Operator Agreement required all revenue generated by Dotson’s business to first go to Budget, which then calculated the commission owed to Dotson and directly deposited commission checks into Dotson’s bank account. In addition to Dotson’s contractual obligations, Budget also maintained other significant controls over Dotson’s business. For example, Budget (1) owned and insured all of the rental vehicles, (2) determined which vehicle groups would be made available, (3) supplied Dotson’s business license, (4) leased the Riverside business location, (5) set the minimum rental vehicle rates, (6) paid for the utilities of the business, (7) provided all uniforms for the business, (8) provided a majority of the furniture, computers, office supplies and equipment at the location, (9) provided the software platform needed to process rental reservations, and (10) had authority to accept or approve of Dotson’s advertising practices. Between November 2006 and January 2011, Dotson operated the Budget rental car business. During this time, Dotson determined the work hours and rate of pay for her employees and contracted with a third-party payroll provider to handle payroll. Although the Operating Agreement did not have an expiration date, it granted both parties the right to terminate without cause upon at least 90 days’ prior written notice. In June 2010, Budget issued two notices to Dotson – a notice of default for “poor performance,” and a termination warning for employee misconduct. Thereafter, providing the required 90 days’ notice, Budget terminated the Operating Agreement, effective January 31, 2011. In consideration for the termination, the parties negotiated, and Dotson received, $17,000 – a figure that represented three months’ worth of commissions for the rental car business. During the initial stages of litigation, all of the plaintiffs – with the exception of Dotson – settled and voluntarily dismissed their claims. On October 29, 2014, after agreeing that the critical facts were not in dispute, the parties filed competing motions for summary judgment. In her motion, Dotson sought summary judgment on her claim for declaratory relief – seeking a judicial declaration that she was an employee of Budget. Alternatively, Defendants sought summary judgment of Dotson’s entire action arguing, among other things, that the undisputed evidence demonstrated that Dotson was an independent contractor and not an employee. At the onset of their motion, the Defendants directed the court to Patterson v. Domino’s Pizza and Juarez v. Jani-King of California, Inc. in an attempt to convince the court to abandon the common law test for an employment relationship when analyzing a licensor/licensee business model. By extending Patterson and Juarez to the operator relationship between Dotson and Budget, the Defendants argued that the court would avoid the “false positives” that might result from the court’s application of the common law test for an employment relationship. Dotson argued that the franchise cases of Patterson and Juarez are distinguishable from this case as her Operator Agreement expressly denounced the existence of a franchise relationship and made clear that Dotson did not pay a franchise fee. Instead, Dotson relied upon the unpublished Ninth Circuit decision in Adees Corp. v. Avis Rent A Car Sys., Inc. – which included a similar (if not identical) Operator Agreement to the one at issue in this case. In Adees Corp., an independent operator sought franchisee status in an attempt to avail himself to the protections of the California Franchise Relations Act as it relates to the defendant’s’ termination of the Operator Agreement without good cause. Rejecting the independent operator’s argument, the court found that the governing Operator Agreement did not create a franchise relationship in the absence of a franchise fee. Relying upon the Ninth Circuit’s findings in Adees Corp., Dotson argued that she should not be treated as a franchisee where she “does not have the rights and remedies a ‘franchisee’ would have in relation to its ‘franchisor.’” In other words, Defendants should not be able to have their cake and eat it too. Although acknowledging that the California Supreme Court may someday extend the reasoning of Patterson to the quasi-franchise relationship, the court refused to apply the decisions in Patterson and Juarez to the business format license at issue in this case. The court found it to be “undisputed” that Dotson was not availed to the rights and remedies available to a franchisee under the law. Though the court found the payment of a franchise fee to be a “mere formality,” this formality implicated the parties’ substantive rights and served as the basis for the court to refuse to treat Dotson as a franchisee. After the court refused to apply Patterson and Juarez to the quasi-franchise context, the case came down to the issue of control under the California common law test identified in Alexander v. FedEx Ground Package Sys., Inc. In light of the competing inferences, the court refused to conclude, as a matter of law, that the Defendants did or did not exercise “all necessary control” over Dotson. The parties’ competing motions for summary judgment – to the extent they were based on the issue of whether Dotson was an employee – were denied. Ambrose v. Avis Rent a Car Sys., 2014 U.S. Dist. LEXIS 170406 (C.D. Cal. Dec. 8, 2014). Avis was later dismissed from the lawsuit after all plaintiffs that were independent operators of an Avis Rent A Car business settled their claims with Avis. Patterson v. Domino’s Pizza, LLC, 60 Cal. 4th 474 (2014). Juarez v. Jani-King of California, Inc., 2012 U.S. Dist. LEXIS 7406 (N.D. Cal. 2012). Patterson v. Domino’s Pizza, LLC, 60 Cal. 4th at 498. Juarez v. Jani-King of California, Inc., 2012 U.S. Dist. LEXIS 7406 at *4 (quoting Cislaw v. Southland Corp., 4 Cal. App. 4th 1284, 1296 (Cal. Ct. App. 1992). Ambrose v. Avis Rent a Car Sys., 2014 U.S. Dist. LEXIS 170406 at 16*. Adees Corp. v. Avis Rent a Car Sys., 157 Fed. Appx. 2, 2005 U.S. App. LEXIS 19956 (9th Cir. Cal. 2005). Ambrose v. Avis Rent a Car Sys., 2014 U.S. Dist. LEXIS 170406 at 19*. Alexander v. FedEx Ground Package Sys., Inc., 765 F.3d 981, 988 (9th Cir. 2014) (“The principal test of an employment relationship is whether the person to whom service is rendered has the right to control the manner and means of accomplishing the result desired. [Internal quote omitted].”). Ambrose v. Avis Rent a Car Sys., 2014 U.S. Dist. LEXIS 170406 at 28*.